As the body count rises with each performance, one girl at this infamous theater-based summer camp finds herself contemplating what’s real and what’s not. Sign Up For Release Notification — When you do, you are automatically entered to win a free copy of the book, and you will also have an opportunity to purchase the book at the new release discounted price. We will only email you once for these purposes, and your email from this list will not be used for any other reason at any other time. Welcome to my little corner of the internet! I’m so glad you’re here. I’m celebrating the release of JANUARY BLACK by giving away brand coffee cups or $10 Amazon gift cards to a few lucky readers. There will be two winners every day. 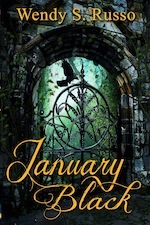 PLUS, each of the blog posts hosting JANUARY BLACK between January 15-21 will have a link to a hidden post on my blog. (Password = matty). Commenters on this hidden post will be entered into a drawing for a free, signed copy of JANUARY BLACK. Here’s the tour! Have fun and leave comments! So, a while back on a Six Sentence Sunday post, I mentioned a snag with the publication of January Black. Well, that snag may have been sorted out with the help of Melissa Robitille, a writer/freelance editor. (You can follow her on Twitter.) I’m all sorts of amazed by her, not least of all by the fact that she gave me an award. The Liebster Award. For blogging. Which, if it weren’t for SSS, I’d be totally failing at. You give 11 random facts about yourself and answer the 11 questions asked by the blogger who nominated you. Then you think up 11 new questions and nominate 11 new blogs – and you can’t nominate the blogger who nominated you. I was a premie. I was born 8 weeks early in an air force hospital and spent 11 days in an incubator. As the story goes, there were three pre-term babies born that week at that hospital, but I was the only one who went home. I love sarcasm, but it’s sometimes lost on me. I’m fascinated by machinery. I once picked up a cam shaft from a friend’s dining table and said, “It’s so pretty.” Half-a-dozen people looked at me like I had two heads. My husband and I were THIS close to naming our son “Hiro Protagonist.” We thought his English teachers would get a kick out of it. But, Hiro Russo is hard to say. I can engage myself in a repetitive task for months on end. My boss doesn’t get it but seems to appreciate it. I don’t understand “cute shoes” or “cute bags.” My husband picks out my outfits because I’m that fashion impaired. I do get “mean cars,” though. I’m partial to American muscle cars, particularly ’60’s Camaros. I’m bad at math, but I rock at Geometry proofs…which I’ve found practically useless in my adult life. Go figure. My favorite way to eat mashed potatoes is fried. I can’t golf. At all. What motivates you to write when you don’t really feel like writing? Do you prefer being alone, in a group of people you know, or anonymous in a crowd? I don’t like being the center of attention. I like being in small groups, or anonymous in crowds. And I do alright alone. Do you ‘people watch’, and if so what’s the most interesting thing you’ve seen other people do? I think the thing that grabs my attention is when people wear something that defies explanation. Like…who wears flesh colored spandex pants to the mall? Who wears sparkly letters across the seat of their yoga pants? I’m not a fashionista, or even qualified to judge most outfits, but there’s some surprising stuff out there. How many books (a rough estimate, don’t go count them) do you have in your house, and what kind of books are they (yes, eBooks count as books)? A few hundred, I guess. What’s the biggest, best, and shiniest dream you have for your writing career? I got published! Everything after January Black’s release is a bonus. If you could take someone’s place for a day (modern or in history), who would you be and why? I would like to be Joseph Smith on a particular afternoon in April 1820. If you could have a re-do of some point in your life, what would it be and what would you do or say differently? I am where I am today because of life as it’s been. I wouldn’t change a thing. Which family member has been most supportive of your writing and in what way? What part of the writing process (writing, editing, querying, submissions, etc.) is the hardest for you? Blurbs. OMG, I hate writing blurbs. What’s the image on your computer desktop? Which actor is ‘James Bond’ to you? Who was your favorite teacher in high school and why? Do you prefer books, or ebooks? White walls? Or do you need color on your walls? Which character would you like to be more like? How long did it take you to put together this blog post?